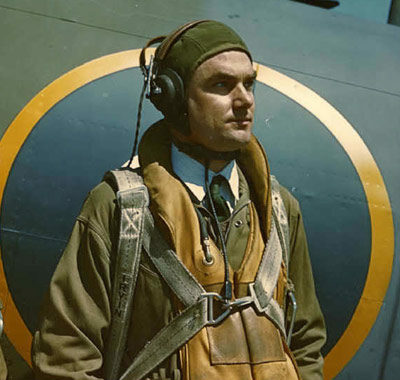 Born in Providence, Parker S. Dupouy (1917–1994) was one of the 57 combat pilots serving as the Flying Tigers in China in the early days of World War II. 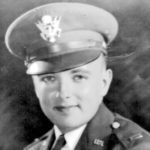 A Central High School grad, he enrolled as an Aviation Cadet after graduating from Brown University in 1939. In May, 1941 he resigned his Army Air Corps commission to volunteer with General Claire Lee Chennault and the Chinese Air Force. He eventually moved to Kunming, China as vice-commander of the Hells Angels Squadron. In July of 1941, his unit (with 18 planes and 25 pilots) destroyed 81 Japanese planes while being outnumbered ten to one. Parker is officially credited with getting 4.5 kills, although records show he probably had an additional seven that could not be independently confirmed. He was awarded the “Chinese Sixth Cloud Banner” after his encounter with a Jap Zero on Christmas day, 1941. Out of ammunition, DuPouy dove on the more maneuverable Zero and sheared off the enemy plane’s left wing. In the process he lost the last four feet of his own right wing. Knowing how scarce P-40’s were, he managed to nurse the plane back to base. This encounter is memorialized in a painting by Dan Zoernig named “One the Hard Way”. Parker also flew Madame Chiang Kai-shek around China while she acted as a keynote speaker throughout the country. After the AVG disbanded, DuPouy went to Republic Aviation on Long Island where he became Chief Test Pilot. He and one other AVG pilot did all of the testing on the P-47 Thunderbolt, directing some fixes which made the plane such an effective weapon. In 1946 he moved to Pratt & Whitney where he tested the experimental B-50 bomber. After the war, he went back to work as an engineer, ending his career with KG Engineering in Woonsocket. He died of cancer at the age of 77.